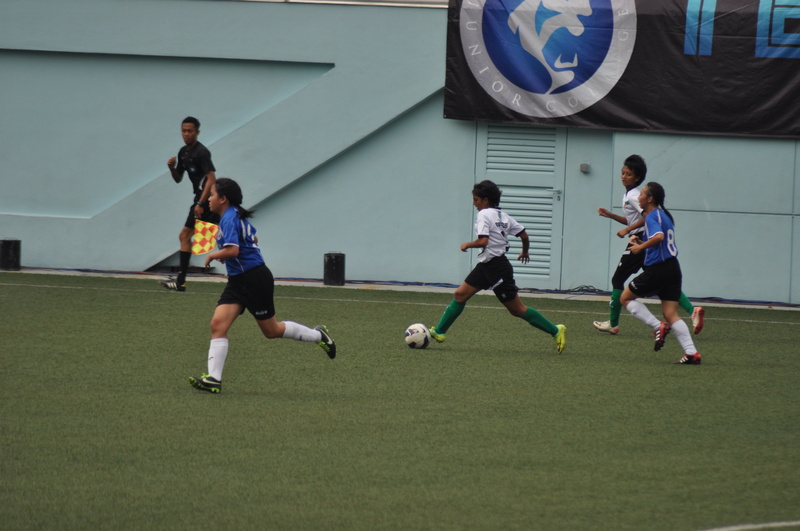 Having narrowly lost to Victoria Junior College in the semi-finals the previous week, our soccer girls took to Jalan Besar stadium on Thursday, determined to win their 3rd/4th placing match against Meridian Junior College. “We came in knowing we needed to beat MJ and end the season on a high note,” said Choo Yunting. Still, the game started off cagily with both teams reluctant to commit players forward and keeping the majority of players behind the ball. Neither side could control possession for significant stretches with kick and chase tactics being used to try and open up the opposing side, resulting in a rather scrappy opening ten minutes. 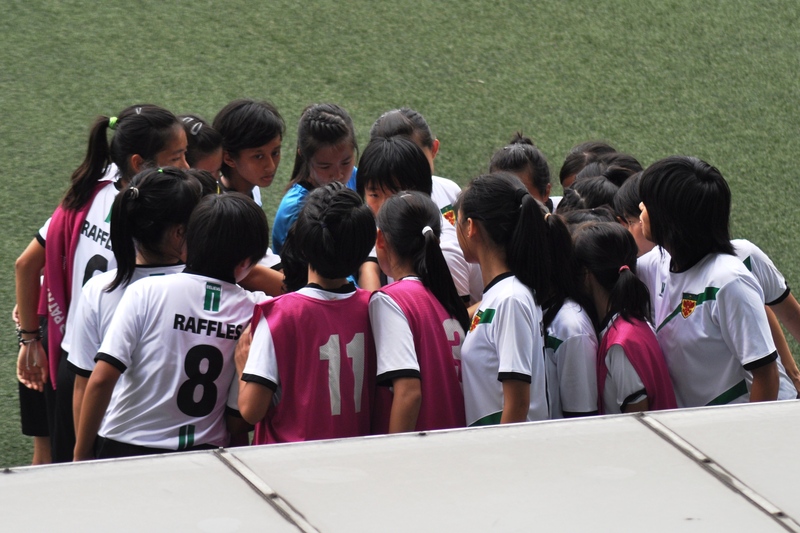 When Raffles did manage to go forward, the majority of our attacks came down the left flank where winger Koo Hui Fen stood out with her good close control and ability to get past her marker. It thus came as no surprise that the best chance of the half came from that route. 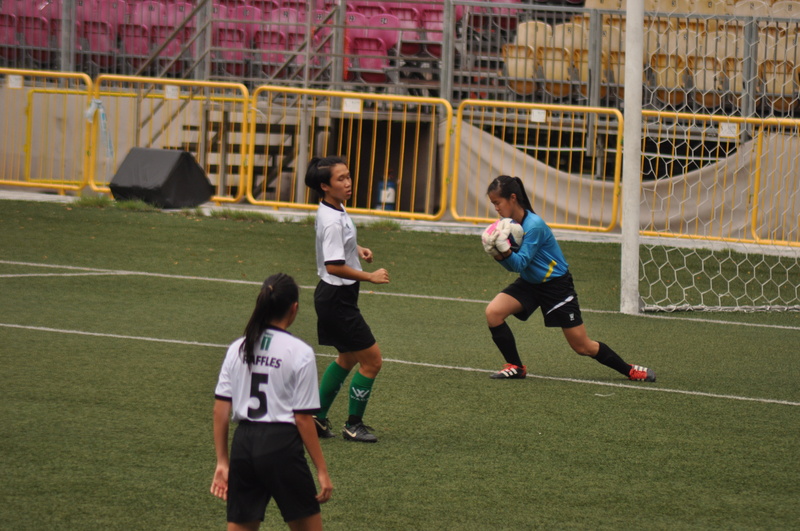 After some neat interplay down the left flank, Hui Fen managed to get to the bye-line and beat her marker, playing a teasing ball low across the face of the goal from the left edge of the penalty area. With the crowd rising in anticipation, the cross just barely eluded her two waiting teammates who were looking to apply the finishing touch. The Meridian defence gratefully cleared the ball, ending the danger. Still, Raffles continued to press on. 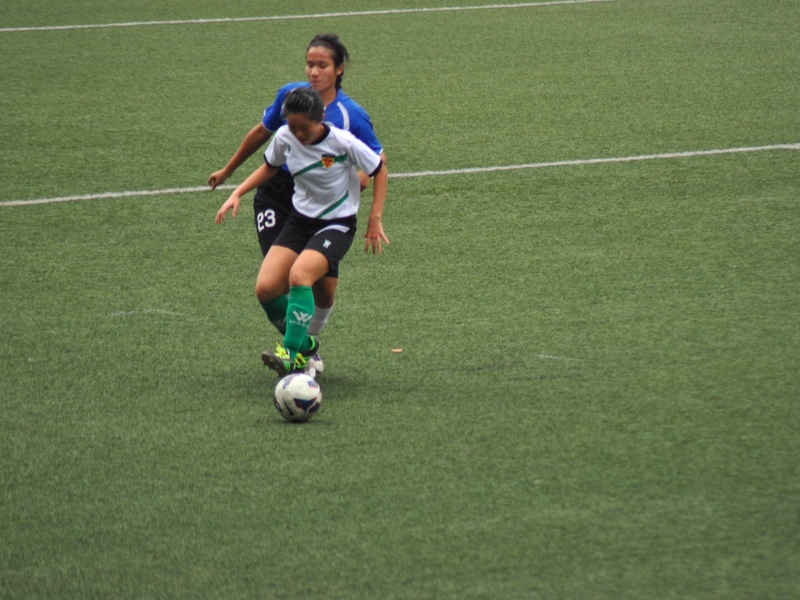 Midfield dynamo, Liza Tay, in particular, was strong in the tackle, harassing the Meridian players into conceding possession. Her ability to win possession was often a springboard for the Raffles team to surge forward, and led to a few half chances. One of the best came when she won possession on the right, and spotted striker Emiline Elangovan darting into the box. She played a precise through ball, but a heavy first touch from Emiline allowed the Meridian defence time to recover. 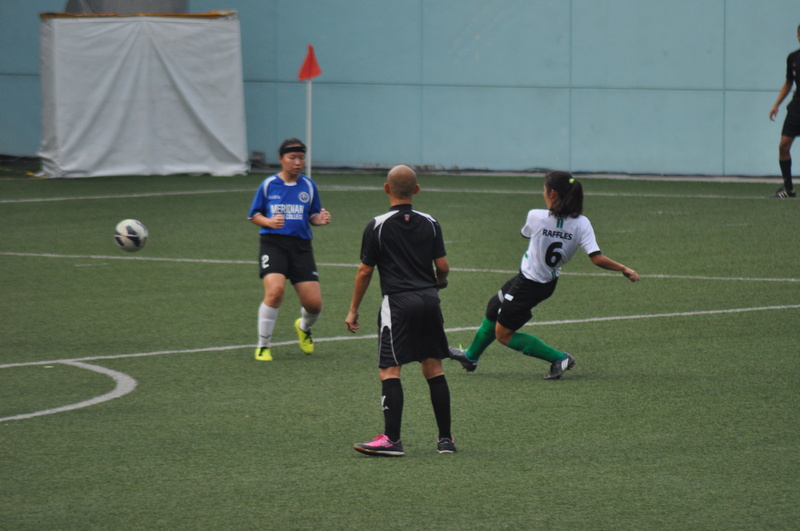 The second half saw a tactical change by the Raffles team as they brought on Jane Ong on the right. Jane had been kept out of the starting line-up due to a knee injury and her introduction clearly made a difference, with Raffles starting to show more attacking intent. A track and field athlete, she was able to use her pace to good effect, and was noticeably the fastest player on the pitch, despite her injury. The Meridian defence, and the left back in particular, found it increasingly impossible to cope with Jane’s surging runs and ability to drive to the bye-line. Within a few minutes of the restart, the left back was pressured into giving away possession to Jane in a dangerous area, and Meridian was lucky to escape when Jane just failed to find a teammate in the box. As the match wore on Raffles increasingly came to dominate possession with Meridian largely pegged back in their own half. They were able to put balls forward for their wingers to chase, and Liza was able to make a few good probing runs at the Meridian defence from midfield. Where Meridian did manage to clear the ball, it inevitably fell back to a player from the Raffles team, in particular Suyun, who was effective in a midfield anchor role. On a few occasions, crosses from the flanks or Liza’s mazy runs down the middle yielded half-chances, but Raffles’ attack found themselves up against a stubborn Meridian defence which successfully prevented the Raffles players from getting their shots away. It was frustrating for the players, even as they continued to put the Meridian defence under increasing pressure. Then came the moment that everyone thought would win the game for Raffles. After good movement down the right, Emiline was able to brilliantly turn her marker and cut the ball back towards the penalty spot. Liza was perfectly placed and struck the ball sweetly, only to see it cannon downward off the crossbar and into the grateful grasp of the Meridian goalkeeper. Tiredness was visibly getting the better of the players and the match began to peter out, with Meridian conceding possession far too cheaply in their own half. The Meridian striker cut a lonely figure as the rest of her team packed the defence, with up to seven players in their own box. Raffles resorted to trying their luck from distance, with Jane and Liza taking shots from 20 yards without really troubling the keeper. 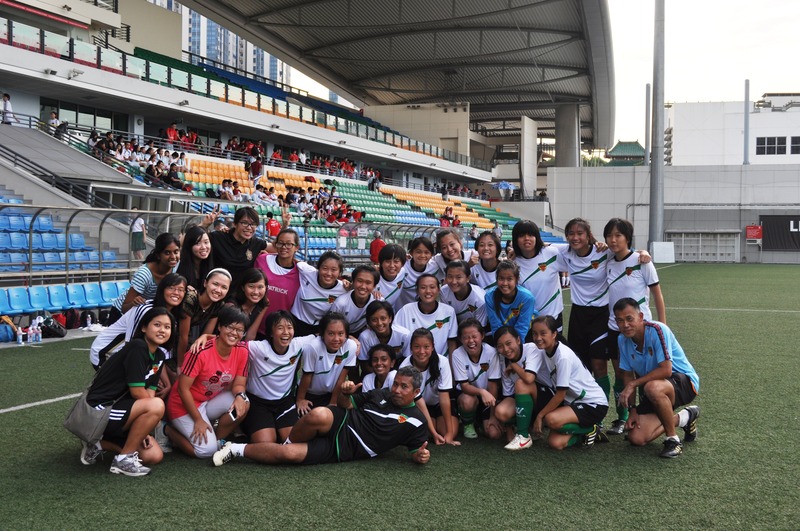 The final whistle saw both teams deadlocked at 0-0 despite Rafflesian dominance. Meridian came out flying at the start of extra time, showing renewed attacking intent. 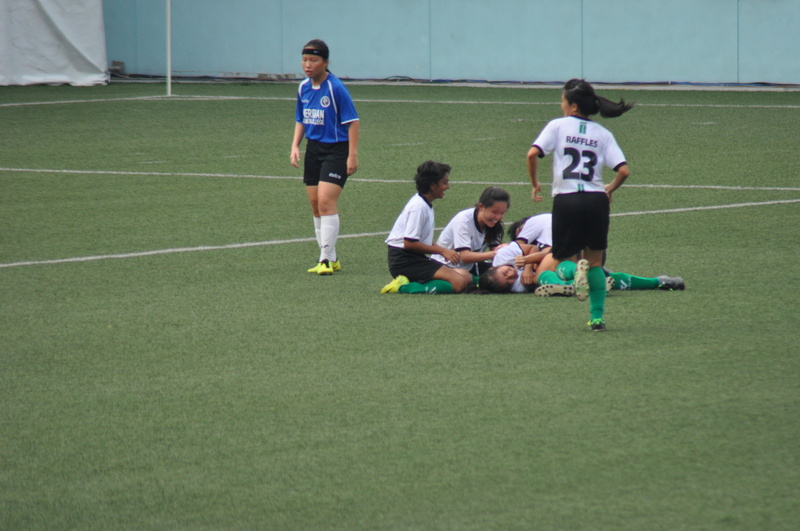 After largely being on the defensive, they managed to break down the left flank before center-back Shayna Kam made a last-ditch tackle to snuff out the danger. With tiredness affecting both teams, the game become more open and Raffles responded with a break down the left of our own. Hui Fen made a purposeful run down the left, making a neat turn to leave her defender trailing. Ghosting past another defender, she dribbled into a dangerous area, but the Meridian defenders successfully managed to nullify the threat. Then came the defining moment of the game. With the end of the first period of extra time in sight, Liza picked up a loose ball in midfield, jinked past three defenders on the right and drove in a low cross that fell to Emiline in the box. Unable to turn or get a shot away, she laid the ball off to Hui Fen who found Jane, in space, at the right edge of the penalty area. Jane took one touch to control the ball before sending it curling towards the goal, where it flew over the despairing dive of the Meridian goalkeeper and nestled in the bottom left-hand corner of the net. Jane fell to the ground, her arms raised in both ecstasy and relief, and was soon mobbed by her teammates. Later, Jane told us, “I’m really surprised it went in. I was really glad, but I didn’t expect it, because I’ve just come back from an injury and am very unfit.” But nothing less was expected from the team: “I was very relieved when the goal came, but I knew it was coming, I believed that someone would score the goal,” said Suyun. From then on, Meridian was playing catch-up and much of the exchanges were scrappy. Raffles, playing with ever greater confidence, had a chance to put the game away, when Liza played an excellent through ball to Jane, but her shot lacked enough power to trouble the keeper. They were almost made to pay when a rare defensive lapse led to a Meridian breakaway and a clearance from Shayna fell kindly to the Meridian striker. Thankfully, the Raffles keeper, Wenqi was alert to the attempt to chip her. There was to be no other moments of high drama, with Raffles showing good discipline and teamwork until tension was finally relieved by the final whistle. The team fully deserved the victory, after a well-organized, astute and dominant performance. It was a solid team performance with everyone working hard for each other. They had a clear game plan to first soak up the pressure and then attack, and this was carried out very effectively. “They played well”, commented Mr Man, their coach, “the defence played well, but for us today, attack was the best form of defence”. I am sure the exhausted Meridian team would agree. Photos courtesy of the soccer girls. The word ‘grateful’ or ‘gratefully’ appeared three times in this article. Enjoyed the article, but please look out for repetitive adjectives/adverbs!